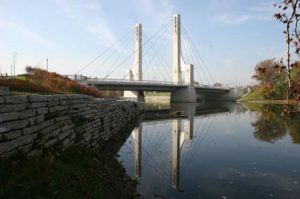 The cable-stayed suspension bridge carrying Lane Avenue over the Olentangy River, on the campus of The Ohio State University (OSU), was opened five months ahead of schedule with a festive ribbon cutting ceremony on November 14, 2003. It is a true celebration of modern engineering, technology and the more than 300 men and women who contributed their expertise and talents to the building of this landmark structure. Under the jurisdiction of Franklin County Engineer Dean C. Ringle, ground was broken for the bridge on February 27, 2002. Preliminary work involving site preparation and temporary pedestrian bridge construction began immediately. Through the spring and summer months the abutments and pier for the south half of the bridge were built and a water line was relocated. 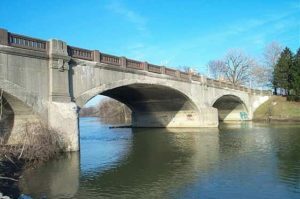 Closure of the old Lane Avenue Bridge occurred on November 25, 2002 following the OSU football team’s final home game of the season. Demolition crews proceeded to clear the site for an intensive year of construction that included the building of the new bridge and reconstruction of the Lane Avenue and Olentangy River Road intersection. The $15.6 million project was built by the C.J. Mahan Construction Co. of Grove City, with construction management provided by the Franklin County Engineer’s Office. Major sub-contractors included Shelly & Sands, Inc. of Columbus; Delta Erecting, Inc. of Harrison; C.J. Bridge Co. of Grove City; Jess Howard Electric Co. of Columbus; Bale Contracting, Inc. of Columbus; and the Paul Peterson Co. of Columbus. Jones-Stuckey Ltd, Inc. of Columbus prepared the plans for the bridge, which included nearly 200 pages of construction drawings. The unique design was selected by a civic committee to artistically reflect the social and economic vibrancy of the Lane Avenue corridor and to have the least environmental impact on the river. Participants included representatives from the County Engineer’s Office, OSU, the City of Columbus and neighborhood organizations. This is the second cable-stayed suspension bridge entirely built in Ohio and Franklin County, and it reflects the latest technologies in bridge construction. The double-span, steel and concrete structure is 370 feet long, 112 feet wide, and carries six 12-foot wide vehicular lanes and two 12-foot wide sidewalks. The pier towers stand 145 feet above the river and hold ten multi-strand cables on each side of the bridge to support the deck. More than 36 miles of post-tensioned cable strands are embedded within the concrete to strengthen the deck and edge girders. 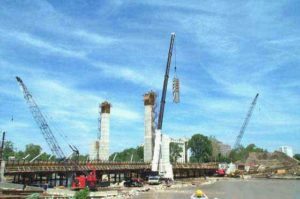 On May 21-22, 2003, a 550-ton capacity crane was used to install a 52-ton (104,000 pound) cable anchorage assembly atop each of the concrete pier towers. The Engineering News Record cited the anchorage assemblies as the heaviest single pieces of steel ever to be galvanized, and lifting them into place at such a height and angle was a major hurdle in building the bridge. The busy intersection of Lane Avenue and Olentangy River Road was rebuilt in accordance with plans designed by ms consultants of Columbus. This work involved the construction of newly aligned asphalt roadways featuring turn-lanes, storm sewers, curbing and sidewalks; and the installation of new traffic signals, signage and street lighting. Funding for the project was provided by the Ohio Public Works Commission ($5 million), Federal Highway Administration ($5 million), Franklin County Engineer’s Office ($3.2 million from license plate fees), and City of Columbus ($2.4 million). The first Lane Avenue Bridge, built around 1905, was an overhead iron truss structure. It survived the great flood of 1913, but was determined to be inadequate for future flood conditions. The second bridge was a four-span, earth-filled concrete arch structure opened in 1919. The designer was noted bridge engineer Wilbur J. Watson of Cleveland, who previously designed the King Avenue Bridge (opened 1914) and the Third Avenue Bridge (opened 1917). In 1998, a condition study of the old Lane Avenue Bridge by the County Engineer’s Office concluded that advanced deterioration of the arches, sidewalks and railings combined with the need to have a wider deck to meet growing traffic and pedestrian demands would require the bridge to be replaced. Our Lane Avenue Bridge was designed and built in the spirit of the county engineer’s historic tradition of providing the finest transportation system for the citizens of Franklin County, Ohio. May all those who pass this way feel the grandeur of modern engineering and technology.